Beetles are one of the main groups of insects. Their order, Coleoptera (meaning "sheathed wing"), has more species in it than any other order in the entire animal kingdom. Forty percent of all described insect species are beetles (about 350,000 species), and new species are regularly discovered. Estimates put the total number of species - described and undescribed - at between 5 and 8 million. This is why, when J. B. S. Haldane, a British geneticist, was asked what his studies of nature revealed about god, he replied, "An inordinate fondness for beetles". Beetles can be found in almost all habitats, but are not known to occur in the sea or in the polar regions. They have a major impact on the ecosystem in three ways: feeding on plants and fungi, breaking down animal and plant debris, and eating other invertebrates. 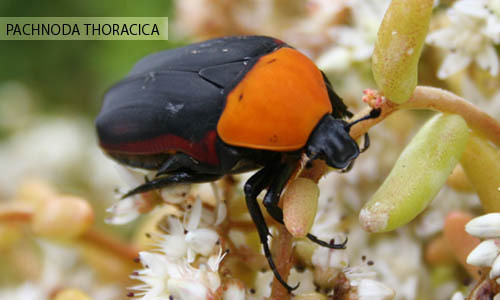 Certain species are agricultural pests in some areas, for example the Colorado potato beetle (Leptinotarsa decemlineata), while other species are important controls of agricultural pests, for example the lady beetles (family Coccinellidae) consume aphids, fruit flies, thrips, and other plant-sucking insects that damage crops. Bearing in mind the wide diversity and number of species the anatomy of beetles is quite uniform. Beetles are generally characterised by a particularly hard exoskeleton, and the hard wing-cases (elytra) which tend to cover the hind part of the body and protect the second wings, the alae. The elytra are not used in flying, but generally must be raised in order to move the hindwings. In some cases the ability to fly has been lost, characteristically in families such as Carabidae and Curculionidae. After landing, the hindwings are folded below the elytra. In a few families, both the ability to fly and the wing-cases have been lost, with the best known example being the "glowworms" of the family Phengodidae, in which the females are larviform throughout their lives. The bodies of beetles are divided into three sections, the head, the thorax, and the abdomen, and these in themselves may be composed of several further segments. The eyes are compound, and may display some remarkable adabtability, as in the case of the Whirligig beetles (family Gyrinidae), in which the eyes are split to allow a view both above and below the waterline. The dorsal appendage aids the beetle in stalking prey. Antennae can vary greatly and may be filiform, claviform, flabellate or genticulate. Oxygen is taken in via a tracheal system: this takes air in through a series of tubes along the body which is then taken into increasingly finer fibres. Pumping movements of the body force the air through the system. Although beetles have blood, it is not used for oxygen transference, although a heart is present. Beetles are endopterygotes with complete metamorphosis. The larva of a beetle is often called a grub and represents the principal feeding stage of the life-cycle. The eggs of beetles are minute but may be brightly coloured, they are laid in clumps and there may be from several dozen to several thousand eggs laid by a single female. Once the egg hatches the larvae tend to feed voraciously, whether out in the open such as with Ladybird larvae, or within plants such as with leaf beetle larvae. As with lepidoptera, beetle larvae pupate for a period, and from the pupa emerges a fully formed beetle or imago. In some cases there are several transitory larvae stages and this is known as hypermetamorphosis; examples include the blister beetles (family Meloidae). The larval period of beetles varies between species but can be as long as several years. Adults have an extremely variable lifespan, again, from weeks to years. Beetles may display some extremely intricate behaviour when mating. Smell is thought to play significant importance in the location of a mate. Conflict can play a part in the mating rituals for example in species such as burying beetles (genus Nicrophorus) where localised conflicts between males and females rage until only one of each is left, thus ensuring reproduction by the strongest and fittest. Many beetles are territorial and will fiercly defend their small patch of territory from intruding males. Pairing is generally short but in some cases will last for several hours. During pairing sperm cells are transferred to the female to fertilise the egg. As befitting such a large order, the parental care between species varies widely. It ranges from the simple laying of eggs under a leaf to scarab beetles, which construct impressive underground structures complete with a supply of dung to house and feed their young. There are other notable ways of caring for the eggs and young, such as those employed by leaf rollers, who bite sections of leaf causing it to curl inwards and then lay the eggs, thus protected, inside. Generally the number of eggs laid is an indicator of the level of parental care subsequently employed, as they are inversely proportional. Beetles and larvae have evolved to employ a variety of different strategies for avoiding being eaten. Many employ simple camoflage to avoid being spotted by predators. These include the leaf beetles (family Chysomelidae) that have a green colouring very similair to their habitat on tree leaves. A number of longhorn beetles (family Cerambycidae) bear a striking resemblance to wasps, thus benefitting from a measure of protection. Large ground beetles by contrast will tend to go on the attack, using their strong mandibles to forcibly persuade a predator to seek out easier prey. Many species, including lady beetles and blister beetles, can secrete poisonous substances to make them unpalatable. Beetles entered the fossil record during the Lower Permian, about 265 million years ago. Polyphaga is the largest suborder, containing more than 300,000 described species in more than 170 families, including rove beetles (Staphylinidae), scarab beetles (Scarabaeidae), blister beetles (Meloidae), stag beetles (Lucanidae), and true weevils (Curculionidae). These beetles can be identified by the cervical sclerites (hardened parts of the head used as points of attachment for muscles) absent in the other suborders. Adephaga contains about 10 families of predatory beetles, includes ground beetles (Carabidae), predacious diving beetles (Dytiscidae) and whirligig beetles (Gyrinidae). In these beetles the testes are tubular and the first abdominal sternum (a plate of the exoskeleton) is divided by the hind coxae (the basal joints of the beetle's legs). Archostemata contains four families of mainly wood-eating beetles, including reticulated beetles (Cupedidae) and telephone-pole beetles (Micromalthidae). Myxophaga contains about 100 described species in four families, mostly very small, including skiff beetles (Hydroscaphidae) and minute bog beetles (Sphaeriusidae). These suborders diverged in the Permian and Triassic. Their phylogenetic relationship is uncertain, with the most popular hypothesis being that Polyphaga and Myxophaga are most closely related, with Adephaga an outgroup to those two, and Archostemata an outgroup to the other three. The extraordinary number of beetle species poses special problems for classification, with some families consisting of thousands of species and needing further division into subfamilies and tribes.